Why is it so important to guarantee your users a satisfying and positive experience, designing made-to-measure processes, interfaces and communication channels to meet their needs? User satisfaction is measured through positive feedback, dynamics in user activities and dialogue with the company and attention and loyalty on a daily basis. The role of IT is to contribute to maintaining a loyal relationship with users, guaranteeing timely and efficient service provision; offering an intuitive web interface highly responsive to users’ needs and expectations; developing automated processes that make service provision flows as efficient as possible; creating a context of immediate cross-channel dialogue and a collaborative approach to service management. Users expect a positive experience, with Service Management providing the foundation for top efficiency in how companies manage the daily complexities of service delivery. 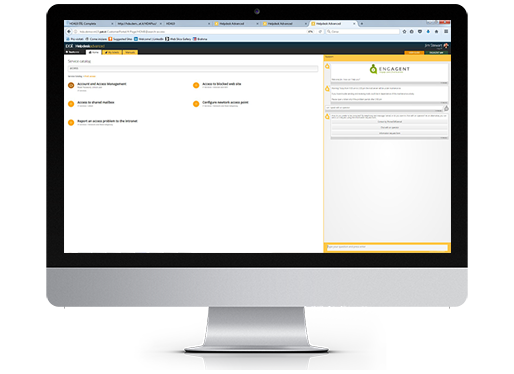 HelpdeskAdvanced is designed to place users - their expectations and levels of criticality - at the heart of Service Management operations. This is achieved by designing and governing the automated Service Management processes running behind the Service Catalog that users browse, and by focusing on self-service modes in managing services, providing a Knowledge Base continually updated with information and solutions to problems that may be encountered on a daily basis. HelpdeskAdvanced puts users in contact with the IT team through rapid and innovative means. It uses Engagent - the Chat-based Customer Interaction system - which provides first-level support and assistance in real time, interacting with users through both human and virtual operators. An optimal user experience is also guaranteed by the Customer Portal web interface, with its processing and interactive dynamics designed to costantly optimise user experience of IT, company and services requested, aiming at raising quality and efficiency to meet user expectations. Ensure users a positive experience, leaving them happy with the services received. Improve service quality and effectiveness, enhancing your users’ experience with the company.